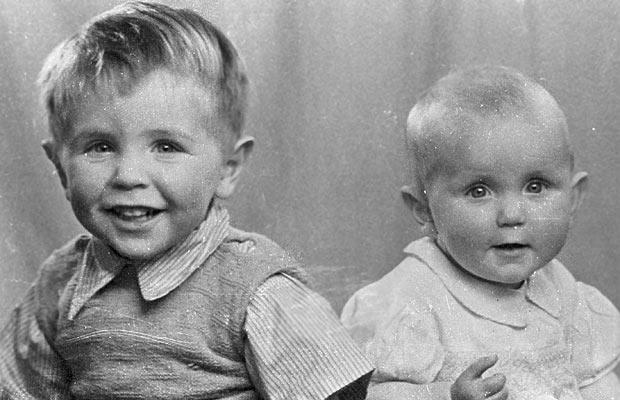 Stephen Hawking (pictured here on the left, next to his sister Mary in 1948) wrote, in "A Brief History of Time", that "If we discover a complete theory, it would be the ultimate triumph of human reason, for then we should know the mind of God." I read that book, and although I do not profess to understand everything in it, I could follow his logic in relation to physics, as it encompassed the philospohies of Spinoza, which were later embraced by Albert Einstein. Mr. Hawking, arguably the most intelligent person on the planet, and who is greatly admired by myself, as well as countless other millions of persons, has now stated that there is no God. He has written, in his new book,"The Grand Design," that the big bang was the event which created "something out of nothing." (I have not read the book yet - this is a quote from the news on my web page) and that "a new series of theories made a creator of the universe redundant." Now, I am in no position to argue the finer points with Mr. Hawking, being humble enough to know my own limitations. But to me it seems to be a disconnect in reason not to see that the belief in something created "out of nothing" is flawed. A basic principle of physics, and nature, and as argued by Mr. Hawking himself in the opening quote to this article, is that everything is connected in some fashion.In essence he states that to find the truth is to know the mind of God. It's all a big circle, with a beginning and perhaps, even more importantly, an ending. In explaining his latest, and perhaps ultimate, triumph, Mr. Hawking should look to himself for the proof of the forgoing conjecture on my part. The saddest thing is to find what you have been looking for all the while, and then upon discovering it, losing sight of what it really is. I believe in the science of Mr. Hawking's latest claim. It was an inevitable conclusion, borne of physics. But I also believe that he has missed the point of his own studies. Einstein, with his belief in Spinoza and the theory of Causal Determinism, set the stage for Mr. Hawking. It is also one of my beliefs, based upon my own life experiences. Change one thing and you change many other things, all of which are connected. It is sad to see Mr. Hawking's departure from this course, which clearly shows, by his own earlier writings, an ordered universe, with a beginning other than "something created from nothing." I just cannot accept that.